We were so blessed by the baptisms of two of our teens on Sunday! Jay was saved at a Teen Rally in 2014 and Jeremiah was saved at our last youth camp. Both these young men have grown up at NCBC and it is such an encouragement to see their desire to obey the Lord in believer’s baptism. All the work that goes into these youth ministries is so worth it when you see souls come to Christ! 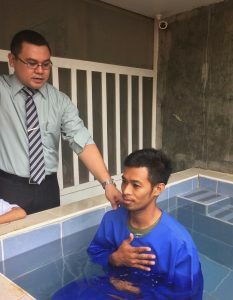 A young man was recently saved and baptized! His story begins like so many others. Someone cared enough for his soul to invite him to church. After hearing a clear presentation of the Gospel, he asked the Lord to be his Savior! Now, he has joined a Bible study and the choir. Last week he even invited his cousin to church! That is the power of the Gospel! Don’t let the good news stop with you. Let us each one reach one and watch God draw sinners to Himself! We want to praise the Lord for two more young men who were baptized this month! It has been our prayer to see souls saved and grow to be faithful members of the church. Too often in our world today, people make professions of faith and then disappear, never to be seen in our churches again. This leaves us to wonder if they were truly saved or if we failed somehow to help them grow. In my own personal witness, I do my best not to push someone to make a decision. If the heart is not ready to recognize their sin and their absolute need of a Savior, praying the sinner’s prayer is not going to help them. We must rely on the Holy Spirit as we share the Gospel with people and not pressure them to “get saved” before they are ready. 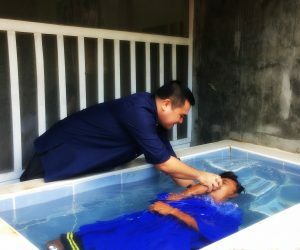 Praise the Lord, the souls we have seen saved and baptized this month, have been faithfully attending church ever since. It is such an encouragement to see fruit that remains! These truly are exciting times for North Cebu Baptist Church! 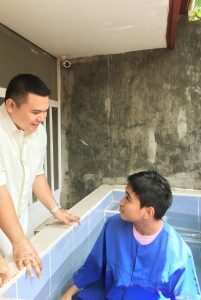 On Sunday, we were blessed to see a young man baptized! This man came to church after meeting, Peter, one of our Bible college students. Peter has a passion for sharing Christ and bringing people to church! 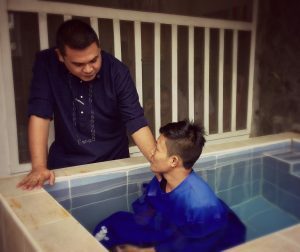 Because of Peter’s heart for others, this man was able to hear the gospel and make the decision to trust Christ as his Savior! It was such a blessing to see this young man take the next step and be baptized! I pray we would get God’s vision for souls and, like Peter, let it become our passion!